A picture may be worth a thousand words, but sometimes they’re the wrong thousand. That’s the case with a photo (above) snapped during Brazil’s massive protests against president Dilma Rousseff on March 13, which has ignited a class spat on social media. It shows a white couple, clad in Brazil’s national colors, on their way to a protest march with a fluffy white dog on a leash and a darker-skinned, white-uniformed nanny pushing their two children in a baby carriage. The picture, which was published by newspaper Correio Braziliense, went viral, with some vilifying the couple for perpetuating practices redolent of slavery even as they went to a political demonstration. The tension may have been partly fueled by the skewed nature of the protests. A poll (pdf, in Portuguese) by Datafolha of protestors in São Paulo found they were disproportionately white, educated, and middle class. Datafolha surveys over the years show that poor Brazilians have consistently been nearly as fed up as their wealthier counterparts with president Dilma Rousseff—who faces impeachment proceedings set to begin this week for illegally covering holes in the national budget, amid a massive corruption scandal in the state oil firm Petrobras. But working-class Brazilians, suggested a report in El Pais (Portuguese), might be less likely to take to the streets. Nor were the protests in São Paulo quite as elitist as they seemed. Around a third of those who went, according to Datafolha, reported having a monthly household income at or below 4,400 reais (about $1,200). 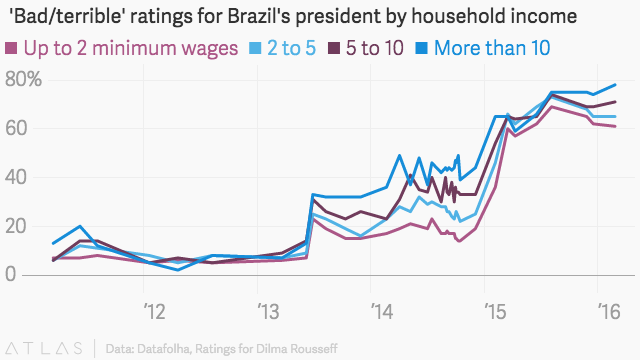 Only 13% earned more than 17,600 reais. So what about the couple in the picture? They are indeed members of the elite. Claudio Pracownik, the man, is vice-president of finance at Rio de Janeiro’s Flamengo soccer club, one of the top clubs in Brazil. But he hit back at his critics in a feisty Facebook post (in Portuguese), saying that—unlike the people he was protesting against—he earns his money honestly, pays his taxes, has his assets registered in his own name, and creates jobs, among them his nanny’s. “I treat her with respect and offer her the dignity to which any employee is entitled,” he wrote. Many people on social media rallied to his defense. The photo is reminiscent of another widely shared one that made people jump to the wrong conclusions—a picture of a group of young people in a convertible Mini driving through a Beirut neighborhood that had been destroyed by Israeli bombing. That image, which won the prestigious World Press Photo award for 2007, appeared to depict a group of well-off youth gawking at others’ misery. As it turned out, they were actually local residents who had fled the neighborhood during the bombing and had come back in a borrowed car to try to find out if their apartment building was still standing. The moral: pictures often tell only the story you want them to.